This week on the Shire Farm we continue the trend of a new item every week of the season. This week we have a new, very unique item, the Garden Huckleberry. This item is a fruit that grows on a very quick growing bush and is an annual unlike most fruits. It is very important not to eat this fruit raw, it will not be very tasty! Sweeten them up by cooking them at a simmer for 20 minutes with 1-1/4 cups of sugar. In other news the cucumbers and summer squash are coming to a close for the season. Melons are getting close but are not quite ready yet. We also have some fall favorites like pumpkins and spaghetti squash in the weeks to come! But my favorite way, by far, to eat ground-cherries is in a pie. To make this festive dish, combine 2 cups of sugar with 2 tablespoons of flour and 1/2 teaspoon of cinnamon. Then, add 4 cups of husked, ripe cherries, 2 tablespoons of melted butter or margarine, and 2 tablespoons of lemon juice. Pour the filling into a 9" unbaked pie crust, cover it with another sheet of dough, cut a few slits in the top for venting, and bake it at 350°F for 45 to 55 minutes, or until the crust is golden. We have tomatoes to go home with everyone from our greenhouse. Below is a link to Farmer Figgins' post about all the varieties you will be seeing this season. Fortunately we do still have slicers and romas growing in the greenhouse which can be used very universally. Another summer favorite that is easy to use in a lot of different recipes. We will have a mix of Zucchini,an heirloom variety, costata romanesco zucchini and Yellow Crook Neck squash for everyone this week. These are starting to get large enough for making zucchini bread one of Farmer Figgins' favorite way to use squash! We've got bunches of Parsley, Terragone, Dill, Italian Basil and Lemon Basil this week, enjoy! This week on the Shire was of course a sad one as we had to pull out all of our outdoor tomato plants, a huge blow to the farm. Luckily, we do still have our greenhouse tomatoes uninfected leaving some tomatoes for everyone. This does likely mean we will not have quantities for storage this year. 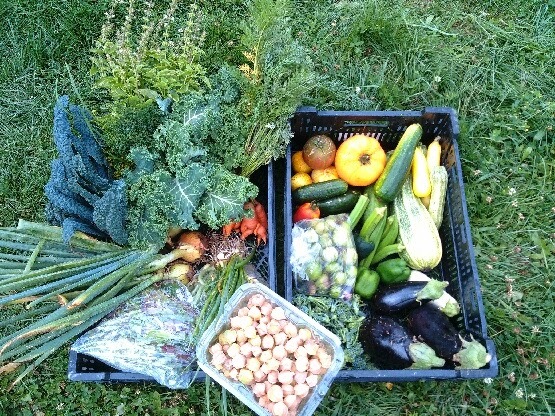 None the less the share still looks great this week, featuring two more new vegetables for the season. This week sara dug out some carrots for everyone, and also one of our most exciting new ventures on the farm, Ground Cherries! NEW THIS WEEK! These orange delights are a very popular vegetable. They are wonderful, and sweet, when eaten raw. For a real treat try glazing the carrots with stock and butter, yum. This week we have a return of the lettuce mixes! A combination of green oakleaf, red oakleaf, green romaine, and red romaine. Enjoy! We have a purple variety, perfect for ratatouille or eggplant Parmesan. Raw eggplant can have a somewhat bitter taste, but becomes tender when cooked and develops a rich, complex flavor. The flesh is smooth and meaty, capable of absorbing large amounts of cooking fats and sauces, making for very rich dishes and making it a great meat substitute for vegan and vegetarian dishes! This is probably Farmer Figgins favorite specialty crop we grow. This is an Heirloom variety of cucumber that doesn't grow large green fruits. Instead these small apple sized cucumbers have a bright yellow skin. They make a fantastic snack with no clean up because the entire thing is edible and delicious. They can also be used to make your favorite cucumber salad recipe. The beans are finally beginning to slow down to Farmer Figgins' delight, but should still be available for a little longer. We are growing a mix of varieties this year so you will be seeing a mix of Green, Purple, and Yellow Green Beans throughout the season. This summertime favorite is loved by almost everyone. Raw they are very tasty but there are all sorts of ways to prepare this veggie. Steam them, bake them, bread and fry them it's hard to go wrong here. You can also pickle these along with a few cucumbers! We've got bunches of Garlic Chives, Dill, Italian Basil and Lemon Basil this week, enjoy! Well every year of growing vegetables is always unpredictable. While in many ways the garden has been overwhelmingly an improvement on last year, we had a huge set back this week. Our outside tomatoes, which is the large majority of the crop, have been stricken by Late Blight. This is a disease which tomatoes and potatoes are particularly susceptible, but can also affect peppers, eggplant, and our ground cherries. It turns the leaves papery and brown, and causes the fruit to rot. Unfortunately there is no cure or prevention for this either, and we must remove and burn the plants so we can protect our other non infected crops. We do still have our greenhouse tomatoes, but this will drastically reduce the tomato availability we thought we would have this season. 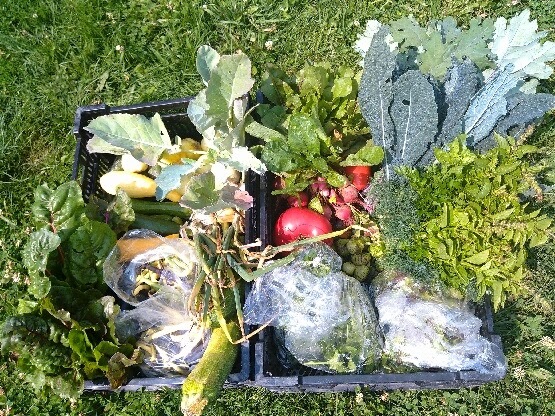 Otherwise though another large share with a great mix of veggies this week. Okra, Onion, Broccoli, Cabbage, Green Tomatoes, Peppers, Eggplant, Swiss Chard, Tomatillos, Cucumbers, Green Beans, Summer Squash. NEW THIS WEEK! Okra was a new vegetable to us last year that we brought back again this year. We like to use our Okra by dicing it with a jalapeno and adding it to a cornbread mix. Okra can also be grilled, sauteed, fried, stir-fried, or added to soup. NEW THIS WEEK! We have a green and purple variety of cabbage growing this year. These store well, and we've been enjoying them in eggrolls. We shred up 2 cups cabbage, 1/2c carrots, 1/2c radish, and 1/4c sprouts, some green onions, then adding 1-2 tbsp of soy sauce and rolling 2 tbsp of the mixture in egg roll wraps. Fry it in peanut or canola oil and enjoy! Well since the fruit was doomed we harvested lots of green tomatoes this week. We have a couple suggestions for these, and of course recommend the southern favorite, fried green tomato. We have a few more ripe tomatoes to go home with everyone in addition to the green tomatoes. Below is a link to Farmer Figgins' post about all the varieties you will be seeing this season. The Roma tomato is a versatile variety with lots of flesh that can be used for salsa, tomato sauces, or even as a sliced or diced raw tomato. The large slicing tomatoes are great for a BLT Sandwich. This is a new crop to us this year, but one that was a favorite of many of the farmers Farmer Figgins learned from out in Colorado. This interesting vegetable is related to the tomato and must be removed from it's papery husk before use. It can be used in many of the same ways as a tomato either in sauces or green salsas. This is probably Farmer Figgins favorite specialty crop we grow. This is an Heirloom variety of cucumber that doesn't grow large green fruits. Instead theseo small apple sized cucumbers have a bright yellow skin. They make a fantastic snack with no clean up because the entire thing is edible and delicious. They can also be used to make your favorite cucumber salad recipe. We've got bunches of Parsley, Oregano, Dill, Italian Basil and Lemon Basil this week, enjoy! 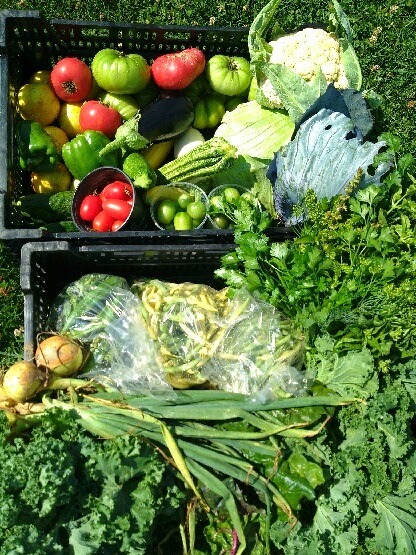 The Garden is reaching full production, and this share has a lot of great veggies for everyone! I'd call this the Salsa Share, as you will have all the supplies in this share! New this week will be Jalapenos, Onions, Beets, and some new herbs! Full Shares will also be receiving Eggplant this week. We also have a return of lettuce mixes and our favorite alien vegetable, Kohlrabi! 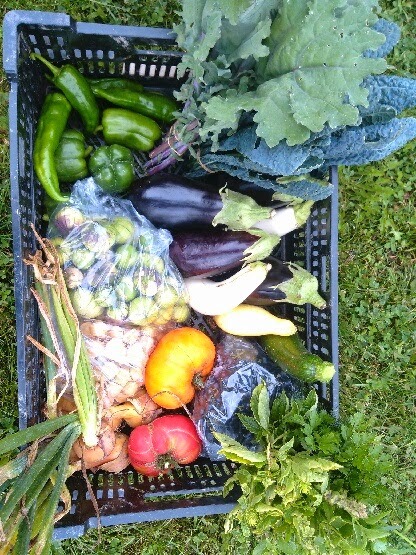 IF YOU WOULD LIKE EXTRA WE WILL HAVE A LIMITED AMOUNT FOR SALE AT DROP OFF OR AT THE FARM OF: BEANS, SQUASH, KALE, LETTUCE MIXES, EGGPLANT, JALAPENOS, BROCCOLI, and CUCUMBERS. Onions, Jalapenos, Beets, Eggplant, Swiss Chard, Lettuce Mix, Kohlrabi, Radishes, Arugula, Tomatoes, Tomatillos, Lemon Cucumbers, Green Beans, Summer Squash, Cucumbers, Kale, Lemon Basil, Parsley, Dill. NEW THIS WEEK! This week we have for their debut in shares for us are Onions. We recommend using your Onion, Jalapeno, tomatillos and Tomatoes to make a simple and delicious garden salsa. We are growing a mix of White, Yellow, and Red onions, and everyone should see a mix throughout the season. Use the onions as you would any onion, we find the Red onions are best for strong flavors, and we like them especially for raw sandwich onions, yellows are very universal useable in any way, and whites are good for cooking with. NEW THIS WEEK! These spicy peppers are probably the most common hot pepper. These flavorful peppers are a great addition to any stir-fry, mexican dishes, spicy Italian dishes, hamburgers, pizza, or for adding the spice of a good salsa or chili. Add some diced up Jalapenos, and Okra to a cornbread and it will make a really delicious southern favorite! NEW THIS WEEK! This red vegetable is one most people either love or hate. Unfortunately we don't particularly love this one. Many people will add beets raw to a salad, others prefer them roasted. The most common use is for the very eye appealing bright red Russian soup, Borsht. An alternative option is to pickle the beets just as you would a cucumber. NEW THIS WEEK! This week we have Eggplant for full shares only. The plants just started producing and like their cousin the tomato will be much more in coming weeks for everyone. We have the large black Italian variety, perfect for ratatouille or eggplant parmesean. Raw eggplant can have a somewhat bitter taste, but becomes tender when cooked and develops a rich, complex flavor. The flesh is smooth and meaty, capable of absorbing large amounts of cooking fats and sauces, making for very rich dishes and making it a great meat substitute for vegan and vegetarian dishes! This quick growing favorite has been giving us an unusual amount of trouble this year. Luckly if you have problems with radishes you can always grow more in a month! This veggie is pretty versatile but is most commonly eaten raw on salads. It can also be roasted, grilled, and we've put them in egg rolls as well! For a really simple snack try a piece of toast with radish and cucumber slices yum. We have more tomatoes for everyone, some Roma, Cherry, and Slicer varieties. Below is a link to Farmer Figgins' post about all the varieties you will be seeing this season. The Roma tomato is a versatile variety with lots of flesh that can be used for salsa, tomato sauces, or even as a sliced or diced raw tomato. The large slicing tomatoes are great for a BLT Sandwich. The Green Beans are wearing out Farmer Figgins, who harvested more than 60 pounds of green beans this week. We will have extra beans available, and this is a easy and really great vegetable for storing. We are growing a mix of varieties this year so you will be seeing a mix of Green, Purple, and Yellow Green Beans throughout the season. This summertime favorite is loved by almost everyone. Raw they are very tasty but there are all sorts of ways to prepare this veggie. Steam them, bake them, bread and fry them it's hard to go wrong here. You can also pickle these along with a few cucumbers! We've got bunches of Parsley, Dill, and Lemon Basil this week, enjoy!